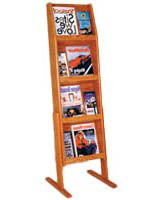 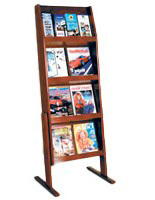 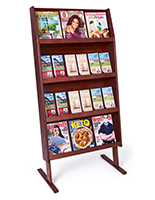 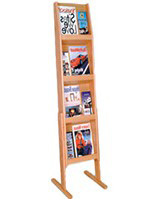 The floor standing 4-shelf brochure stand has 18” wide shelves to accommodate 2 magazines or 4 pamphlets. 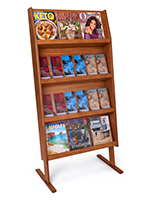 The freestanding wooden literature holder is made of solid oak and finished with a medium stain that brings class to any setting. 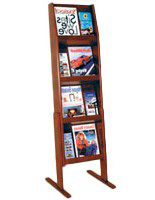 The brochure stand with open shelving has a narrow 4.75” width much like a normal library fixture. 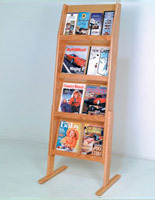 The wooden construction is solid to last through many years of use. 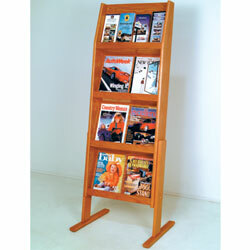 The stand is a compact literature holder and so takes up little space wherever it is placed. 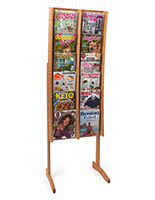 The freestanding magazine rack is best used with more rigid materials because there are no front panels to keep them upright.